As our giveaway-a-month continues in 2011, the stakes continue to get higher as the gear gets more technical and valuable. For May 2011, the extraordinarily popular staple of the REV'IT! ADV touring lineup will be going to one lucky winner at the end of the month. The REV'IT! Sand Jacket and REV'IT! Sand Pants have made many a rider happy over the past couple years with its true four-season all-weather functionality. Excellent performance in the the hot, the cold, and the wet, in addition to high degrees of protection and comfort for the ADV and long-distance tourer are what define the REV'IT! Sand combo. Entry into this contest is a cinch and by entering this month, you become automatically eligible to win our gear giveaway every remaining month in 2011. 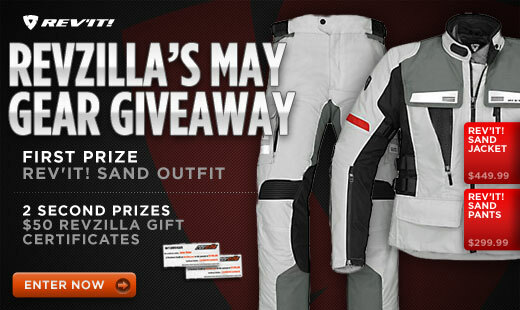 Visit www.RevZilla.com/win and create a rider profile to get your chance to win the outstanding REV'IT! Sand setup this month, and cement yourself into a chance to win free gear every month after that! Visit Official Contest Rules for all the nuts and bolts. I'm also including our REV'IT! Sand Jacket and Pants Review below in case you want to learn more about this combo. Check it out!